Create an interesting focal point in a hallway with this set of two silver wall mirrors. Perfect for a stylish living room or hallway, this set of two modern wall mirrors from Uttermost makes a modern statement. A thin, metallic silver leaf frame creates an outline of metallic radiance, while nestling stunning beveled glass in a novelty shape. Install vertically to open up spaces, using the included anchors, screws pack, and sawtooth hanger. Each mirror is 9 1/2" wide x 36" high x 1 1/2" deep. Hang weight is 13 lbs. Each glass section is 8 3/4" wide x 35 1/2" high. Beveled edge is 1" wide. 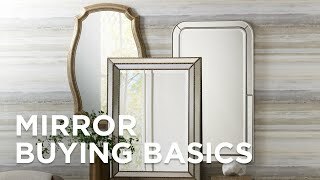 Set of two wall mirrors from Uttermost Sabera Mirror collection. Vertical installation only. Sawtooth hanger with anchors and screws pack included. Metallic silver leaf finish. Steel frame and MDF construction. Beveled glass. Frosted glass and white finish oak combine beautifully in this single-sink bathroom vanity set. Add industrial charm to your decor with this square wall mirror set in a matching champagne silver finish.